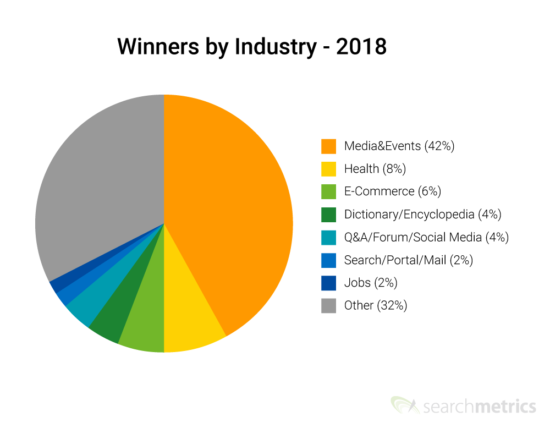 Which websites won big in the Google rankings in 2018? Which domains took a hit in their SEO Visibility? Searchmetrics can reveal the biggest winners and losers in Google.com’s organic search results for the past 12 months. Our analysis includes a presentation of 2018’s most important Google Updates. For this study, we analyzed the development of SEO Visibility for all domains listed in our US index tracked over the course of 2018. The list is ordered according to the absolute increase or decrease seen by the website, when comparing the level at the end of 2018 with that of January 1st. We have filtered out adult and illegitimate streaming sites, as well as domains that have migrated. The year’s winners include several websites that focus on video content. The best-improved domain is one of Google’s own, as it is also part of the Alphabet conglomerate: The global roll-out of video carousels for a vast number of desktop search queries in the summer was the chief reason for YouTube’s SEO Visibility growing 79 percent over the course of the year. 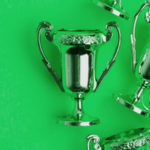 Many health websites also made the list of winners – as did several new domains emerging from about.com’s split, some of which were only launched during 2018. The most successful of these are verywellhealth.com, balancecareers.com and the thespruceeats.com. The following table shows a selection of loser domains that suffered a significant decline in their organic visibility during 2018. As above, these are sorted by absolute change in SEO Visibility, but we have only included domains that lost at least 15% of their SEO Visibility. Please note that inclusion in this list does not necessarily mean that these websites have suffered an equivalent loss in traffic or turnover – this is just an indicator of how much less present they have become in the unpaid search results on Google.com. Google Core Algorithm Update: In March 2018, Google rolled out an officially-confirmed Core update. This caused great changes in the search results. Many webmasters had already suspected that an update had taken place in November 2017. In March, winners from the autumn got an additional boost, and losers dropped further. More information can be found in our blog post on the Google Core Algorithm Update. Video carousels on desktop: In June 2018, Google stated showing video carousels in the desktop search results. The overall number of search results that included video integrations also increased. E-A-T-Update: This official Google Update was rolled out in August 2018, and impacted website rankings based on “Expert-Authority-Trust”. In particular, YMYL (your money or your life) keywords were affected, for which false information in the search results could (potentially) have a negative impact on the user’s health or finances. An iteration of the E-A-T Update, that saw the algorithm altered slightly regarding YMYL searches, was released in October 2018. More information can be found in our blog post on the Google E-A-T Update. 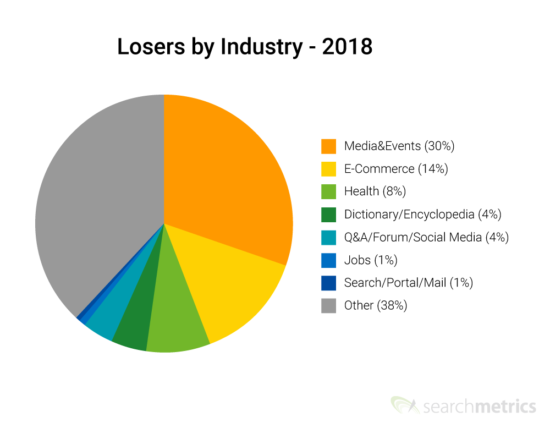 For our industry analysis of 2018’s winners and losers, we have categorized the 250 domains with the biggest increase and the 250 with the biggest decrease in their SEO Visibility. 42% of 2018’s most successful websites belong to the category “Media & Events”. Above all, websites with video content saw big wins. 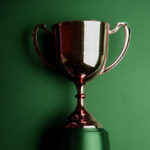 As well as YouTube, we also find fox.com, pbs.com, bbc.co.uk and dailymotion.com amongst the winners. The primary reason for these websites’ success if the major Google Update in 2018, following which more video carousels were displayed in the desktop search results. Websites in the health industry also experienced a lot of turbulence in 2018. Google’s E-A-T Updates in the second half of the year gave many health pages a boost – but at the same time many pages in this industry lost out, as they make up 8% of our 2018 loser list. Here, I would like to summarize the most important trends that helped shape Google search in 2018. Google’s algorithm adjustment in June 2018 was the main contributing factor to YouTube’s 2018 success – the video domain was the biggest winner of the year in our analysis, with a 79 percent increase in its SEO Visibility. The Alphabet subsidiary benefited greatly from the integration of video carousels in the desktop search results, and an overall increase in the number of video results displayed. Your Money or Your Life: This motto had a big impact on the health industry in 2018. The Google E-A-T Update in August and its iteration in October caused enormous turbulence in the search results for sensitive topics i.e. for issues where incorrect information could potentially harm the health or financial situation of the searcher. 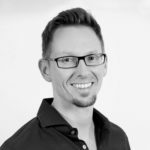 Google raised its requirements regarding expertise, authority and trust, creating the name of the E-A-T Update. The high search volume associated with many health-related queries meant that the fluctuation following this update was most visible for health websites – domains from this industry make up 8 percent of the year’s winners, but also 8 percent of the year’s losers. The chart below shows the SEO Visibility of the health industry’s biggest winner and biggest loser: webmd.com is the winner, medicinenet.com the loser. You can see the big change in early August, which is when the E-A-T Update struck, and the continuation of the trend, particularly for medicinenet.com, in mid-October, where this domain experienced a second big drop. Before the E-A-T Update, the domains were separated by around 1,300,000 Visibility points. By the end of the 2018, the difference was 3,000,000 points. We should point out, however, that some of the first-level domain splits have lost a great deal of Visibility: thebalance.com lost 84 percent; thespruce.com lost 76 percent of its organic visibility. The following charts show us the Visibility of the three biggest domain splits coming from the about.com universe. The development in SEO Visibility for the health and wellness domains, verywell.com, the home/living domains thespruce.com and the finance domains, thebalance.com. What does about.com’s example tell us? Domains that have been amongst the losers in the past or that have wanted to improve their performance, are well advised to rework their content and optimize the user experience on their site. Google rewards clearly clustered content silos that combine excellent content with a top-drawer user experience.